Trinity Hall is an independent school located in Leonardo, New Jersey. The school was founded in September 2013 and serves girls in grades 9-12. I recently spoke with Mary Sciarrillo, head of school, and Theresa Kiernan, director of advancement and admissions, about the school’s recent annual fund video, “All In,” starring faculty members. The video was first released on Giving Tuesday (Dec. 2, 2014). 1. How long did it take to plan, create and film the video? How did you come up with the idea for the video? TK: Our timeline was about two weeks, from concept to finished product. 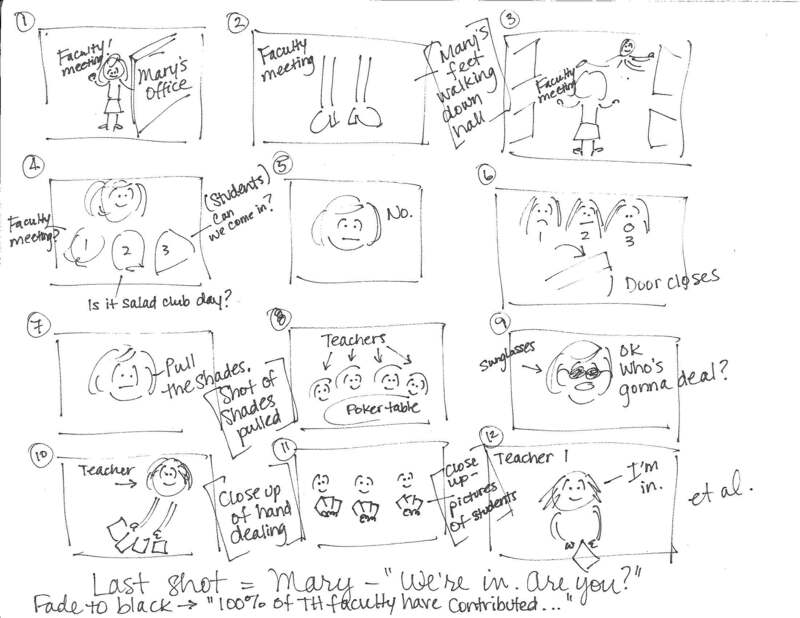 Once we decided on our storyline, we made sure the teachers were willing to star in the video. It turned out they were not only willing participants but also enthusiastic about the creative process, especially the costumes. The most challenging aspect was the timing—our school day is very busy with little down-time to schedule a film shoot. But we made it work. The idea for the video was a natural extension of our faculty’s participation in the annual fund. They were all in, which brought poker to mind. We took that theme and had fun with it. You can view a rough drawing of the concept in this story board I created. We are fortunate that, as a new school founded last year, we do not have a long history of “this is the way we’ve always done it.” This freedom allows us to think in original and inventive ways when communicating and connecting with our constituents. MS: As the head of school, I sent letters in November to parents explaining the annual fund and the connection to our mission and program funding. These letters and their focus on the importance of giving seemed to fall on deaf ears (only a small percentage gave)—hence the motivation to find another way to connect with the parents. As a new school, Trinity Hall has the task of educating not only our 79 students but also our parent community on the independent school model for annual giving. This video provided just the motivation necessary to increase parent giving. 3. Where did you share the video? TK: We initially shared it via email with our community members (board of trustees, faculty and staff, students and their families), and then we published it on Trinity Hall’s website and of course on YouTube, Facebook, LinkedIn, Google+ and Twitter. 2. What were the goals for the video? Is it meant to raise donations or more for awareness? MS: Education is paramount at Trinity Hall, and it is our responsibility to educate our emerging school community on the importance of giving and community support. We decided to have some fun while increasing awareness and participation. We are also trying to establish an atmosphere of giving before our first class of alumnae graduates in 2017. Our annual fund goal is 100 percent participation. We want to establish a culture of giving at our school and teach parents and students that annual giving is typically an expectation at tuition-based schools in the independent school market. Our parents come from many different backgrounds but few attended independent schools, so the concept of annual giving is new. We have already accomplished our goals for the video–increase awareness of the annual fund, increase contributions to the annual fund and extend the potential donor population. 4. Do you plan to do any follow up videos/campaigns around the same theme or was this a one-off experiment? MS: Our students have been asked to give to the annual fund. Once we’ve engaged their interest in and donations to the annual fund (which I predict will happen in a quick fashion), we will ask the girls to do their own video. Participation is our goal—what matters is not what you give but that you give. We are connecting with our community in ways that get attention. We want them to have fun, talk about Trinity Hall and participate! 5. How successful has the video been? MS: Parent giving increased by 1,020 percent after the video’s release on Giving Tuesday, as compared with total donations for the current school year. Most of the donations were online gifts made immediately after parents viewed the video. The video’s release on Giving Tuesday was also coordinated with the release of the online giving option on our website. Together, both the video and the online (credit card) option proved impactful for increasing donations to the annual fund. Contributions are still coming in with parents writing “I’m in!” on the envelopes. I would anticipate a few more videos or events will be needed to get to 100 percent participation but it will happen this year. 6. What have your constituents said about the video?